From the Main Street Food Truck Festival to weaving class for kids and parents to attend together, this weekend is loaded with fun. UPDATE: The Main Street Food Truck Festival has been moved from Saturday to Sunday. The change is reflected in the article below. Storytime with Rapunzel at Whole Foods Market: Come be entertained by an interactive telling of Rapunzel's tale and listen to her beautiful voice as she sings her favorite song! Be sure to stick around for pictures with her in addition to a snack and craft provided by Whole Foods Market. The magic starts at 10 a.m. Visit the Facebook event page for more information. FREE! Little Rock Night Market at Bernice Garden: This brand new event aims to provide a platform for local chefs, startups, artists, and entrepreneurs to showcase their imagination and encourage shoppers to buy local. Visitors will be able to enjoy African and Indian food, live music and more. The fun starts goes from 5-9 p.m. More details are available here. FREE! Secret Keeper Girl at Otter Creek Assembly: This event for girls and their moms (or grandma, aunt or other role model) is a live Christian show promoting self confidence, modesty and other valuable traits. The program is recommended for girls ages 7-12 and more details about the show are available here. Regular admission is $22 and tickets are available here. The Secret Keeper Girl Masterpiece World Tour goes from 6:30-9 p.m.
3rd Annual Harvest Night at the Arkansas Foodbank: This family-friendly event at the Arkansas Foodbank includes a barbecue and catfish dinner, live entertainment and children’s activities. A relaxed atmosphere provides a night of fun for the whole family, while raising awareness about the Arkansas Foodbank’s work. The fun goes from 5-8 p.m. Admission is $40 for adults and kids 12 and under get in free. Head to the website for more information. 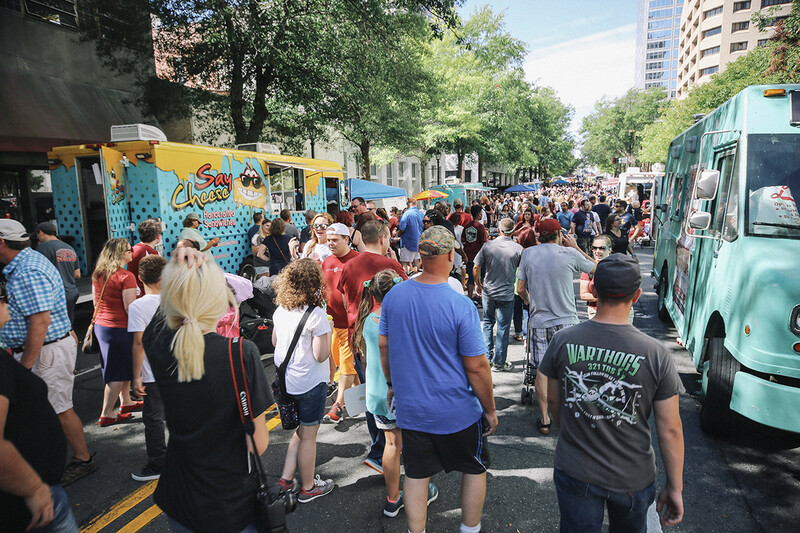 Main Street Food Truck Festival in Downtown Little Rock: The Festival hosted nearly 50,000 people in 2017 and will include more than 60 trucks and vendors in the heart of downtown. The festival will be held from 11 a.m.-6 p.m. and will span six blocks North and South along Main Street and three block East and West along Capitol Avenue. Every block will be loaded with plenty of food, drinks and entertainment. Visit the website for more details. FREE! Super Sunday Free Family Funday at the Arkansas Arts Center: Enjoy an afternoon of free art making for the whole family! Participants will craft a brooch inspired by the works in "Robert Baines: Living Treasure and Fabulous Follies." The fun goes from noon-3 p.m. and attendees can drop in at any time during that window. All ages are welcome. Visit the website for details. FREE! Weaving Basics at South on Main Creative: Learn weaving basics along with your son or daughter (ages 5 and up) in this fun class. Participants will work on a small, colorful tapestry and learn several techniques. Bring your own yarn if you'd like or it will be supplied as part of the materials fee. Registration is $50 in advance and a $15 materials fee upon arrival; the class goes from 1-4 p.m. Click here for more information and to sign up. Arkansas Comic Con at the Statehouse Convention Center: Arkansas Comic Con is a two-day event that brings together a diverse list of guests, vendors, artists and fan groups, in an affordable, family-friendly environment. The doors are open from 10 a.m.-6 p.m. Saturday and 11 a.m.-5 p.m. Sunday. Admission is $20 for adults and $5 for kids ages 2-8. Visit the website for more details. Want to take a little road trip this weekend? Head to the 23rd Annual Arkansas Hot Air Balloon State Championship in Harrison from Friday through Sunday. Bring your lawn chair, $5 for tethered rides (Saturday only) and enjoy an art festival on the square, a car show, a 5K and much more. This event is hosted by Harrison Regional Chamber of Commerce. Check the schedule on the website for event details.